October 10, 2015. KDE today announces the release of KDE Frameworks 5.15.0. Transaction: Fix documentMTime() and documentCTime() using wrong Dbis. balooctl config: Add "exclude filter"
Cleaner code for failing Baloo::File::load() on DB open fail. Make balooshow fail gracefully if database cannot be opened. Update GTK icon cache when installing icons. Add definition ANDROID as needed in qsystemdetection.h. Fix crash when KDirWatch is used in Q_GLOBAL_STATIC. Clarify how to set KAboutData constructor arguments. Add KCrash::initialize() so that apps and the platform plugin can explicitly enable KCrash. Provide enabled property for QIconItem. kded: simplify logic around sycoca; just call ensureCacheValid. cmake: Fix taglib version check in FindTaglib.cmake. khtml-filter: Discard rules containing special adblock features that we do not handle yet. khtml-filter: Code reorder, no functional changes. khtml-filter: Ignore regexp with options as we do not support them. khtml-filter: Fix detection of adblock options delimiter. khtml-filter: Clean up from trailing white spaces. khtml-filter: Do not discard lines starting with '&' as it is not a special adblock char. KFileWidget: parent argument should default to 0 like in all widgets. KBuildSycocaProgressDialog: run kbuildsycoca5 with QProcess. Use largest timestamp in subdirectory as resource directory timestamp. Simplify and speed up KServiceTest::initTestCase. KSycoca: change DB filename to include language and sha1 of the dirs it's built from. KSycoca: make ensureCacheValid() part of the public API. KSycoca: remove all self() methods for factories, store them in KSycoca instead. KBuildSycoca: remove writing of the ksycoca5stamp file. KSycoca: move all of the kbuildsycoca code into the lib, except for main(). KSycoca: replace DBus notification with file watching using KDirWatch. KBuildSycoca: replace dbus-based locking with a lock file. Do not crash when encountering invalid plugin info. Rename headers to _p.h in preparation for move to kservice library. Remove code for --checkstamps and --nocheckfiles. Allow interacting with multiple X servers in the NETWM classes. On Linux, using packages for your favorite distribution is the recommended way to get access to KDE Frameworks. Binary package distro install instructions. 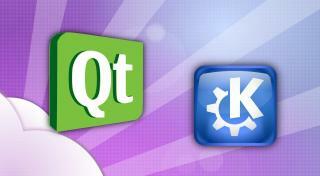 The complete source code for KDE Frameworks 5.15.0 may be freely downloaded. Instructions on compiling and installing KDE Frameworks 5.15.0 are available from the KDE Frameworks 5.15.0 Info Page. Building from source is possible using the basic cmake . ; make; make install commands. For a single Tier 1 framework, this is often the easiest solution. People interested in contributing to frameworks or tracking progress in development of the entire set are encouraged to use kdesrc-build. Frameworks 5.15.0 requires Qt 5.3. A detailed listing of all Frameworks and other third party Qt libraries is at inqlude.org, the curated archive of Qt libraries. A complete list with API documentation is on api.kde.org. Those interested in following and contributing to the development of Frameworks can check out the git repositories, follow the discussions on the KDE Frameworks Development mailing list and contribute patches through review board. Policies and the current state of the project and plans are available at the Frameworks wiki. Real-time discussions take place on the #kde-devel IRC channel on freenode.net. You can discuss and share ideas on this release in the comments section of the dot article. KDE is a Free Software community that exists and grows only because of the help of many volunteers that donate their time and effort. KDE is always looking for new volunteers and contributions, whether it is help with coding, bug fixing or reporting, writing documentation, translations, promotion, money, etc. All contributions are gratefully appreciated and eagerly accepted. Please read through the Donations page for further information or become a KDE e.V. supporting member through our new Join the Game initiative.